Today we are still travelling through Disney Haunted Mansion(s), noting the various differences, and enjoying a dreadful, haunted, and spooky ride! The wall opens into a portrait corridor. When the walls finally do open, guests are ushered into a portrait corridor with paintings that depict seemingly innocent scenes. Windows on the left give guests a peek at the thunderstorm raging outside. With every flash of lightning, the paintings flicker with ghastly images, including a demure young woman sprouting snakes from her scalp (Medusa), a magnificent sailing ship at sea that becomes a tattered and ghostly version thereof in a storm, a man who changes into a decrepit corpse, a knight and horse who both turn into terrifying skeletons, and a woman sitting upon a sofa who is revealed as a were-tiger. 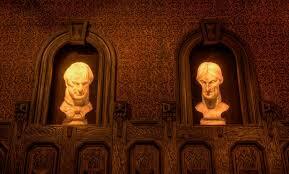 The grim busts of a man and woman placed at the end of the hall seem to turn their heads, glaring at the guests as they walk past. After escaping the portrait corridor, the guests walk through an ethereal void, a boundless realm of limbo, where an eerie green, glowing fog floats between spider webbed-adorned walls, and cobweb-wrapped candelabras dimly illuminate the area. The Ghost Host points out that the house has 999 spirits with room for a thousand ("any volunteers?"). The wall opens directly to the Doom Buggy load area, and will always open underneath the pink lady's portrait, no matter how the room is situated. Seven of the sinister 11 portraits are located in the load area. The wall opens directly to the Doom Buggy load area. Instead of the sinister 11 portraits (the paintings with eyes that follow) the walls are adorned with urns. The wall opens into a hall similar to that of the Disneyland version. At the end is a picture of Melanie Ravenwood dressed in her wedding dress. Guests pass a green bust whose eyes seem to follow them. 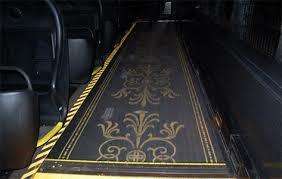 Then guests enter the loading area with a grand staircase, where a raging storm keeps turning off the lights. 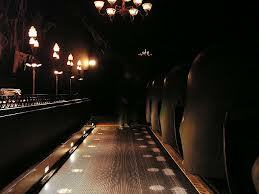 Guests are seated and ascend a pitch-black staircase. A chair whose embroidering resembles a hidden face and a moving suit of armor stand in front of the Endless Hall, where a candelabrum floats down the corridor. 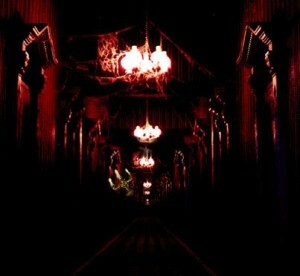 After boarding the Doom Buggies, guests are taken through a room containing a stairwell leading up to a landing, where a candelabrum floats above. 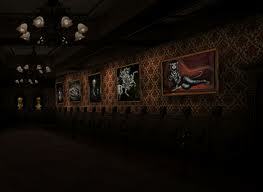 Two of the sinister 11 portraits are located here. 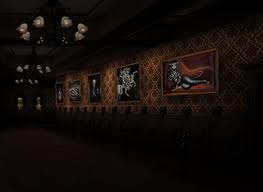 The Doom Buggies then take guests down a long portrait corridor, past flashing lightning windows and ghostly portraits like the ones in Disneyland’s changing portraits corridor (minus the "aging man" portrait). Passing under an archway, guests enter a library with staring busts, moving ladders, flying books, and an unseen ghost rocking in a chair reading a book by candlelight. 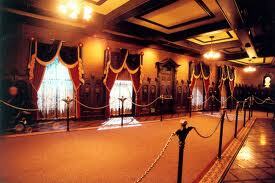 After this is a music room where a shadow plays a mellow version of Grim Grinning Ghosts on a rundown piano. A stormy forest is shown in the window behind the piano. The Doom Buggies then ascend a room full of staircases that defy the laws of physics (like the art of M.C. Escher). Green footsteps appear on the steps of the upside down and sideways staircases. At the top of the stairs, moving and blinking eyes fade into demon-faced wallpaper (there used to be neon-colored spiders and webs, but in the 2007 renovations of the ride, they were retracted). Doom Buggies take guests down a long portrait corridor, past ghostly portraits whose eyes seem to follow guests as they pass. This scene was once at Walt Disney World until the 2007 refurbishment. The guests ride through a dark room filled with giant spiders in webs. This section of Phantom Manor is identical to the Disneyland version, but an audio-animatronic of Melanie bows at passing guests. 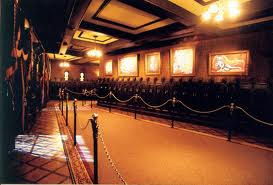 As guests ascend a narrow staircase, whether from the load hall at Disneyland and Disneyland Paris or in the grand staircase scene in Walt Disney World and Tokyo Disneyland, guests come across a living suit of armor, a chair which is embroidered with a hidden abstract face, and a long, narrow corridor down the center of a parlor. Partway down the corridor is a candelabra, floating eerily down the hallway. 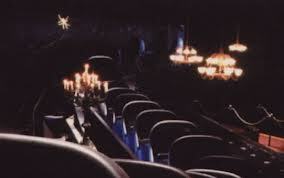 In Paris, the scene is identical to the other versions, but guests see Melanie come into view and out of view, while the candelabra she holds remains in view. As guests pass through the conservatory, the Doom Buggy is spun around to face backward. On the side of the room is a glass room. Dead flowers adorn the whole room with a coffin in the center. A raven sits perched atop a wreath with a banner that reads "Farewell." The coffin's lid is being raised by a pair of skeletal claws while a green glow radiates from the inside. In the conservatory, there is a piano on which sits a red-eyed raven. The keys on the piano seem to play by themselves, an effect obtained by the use of mechanically moving keys. The guests can see the shadow of a phantom pianist projected on the floor. This scene is very much like the Music Room at Tokyo and Florida. 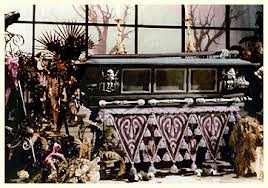 Our ride will have to wait until Monday dearly departed ones! Until then, fare thee well!